Abbey Cleaning Services offers an experienced and professional conservatory cleaning service. We use the latest Ionic Zero Reach & Wash Pure Water System to clean your glass windows, sills, seals and frames which enables us to ensure stunning results every time. The Ionic Zero Reach & Wash system uses the most purified water possible that guarantees to achieve spot free results. The purified water that we use needs no harsh chemicals or harmful additives to clean your glass windows, it naturally attracts mineral deposits and dirt for easy removal that is kind to your conservatory! Solar panels depend on sunlight reaching their surface to produce power. If there is a layer of dirt on the glass surface covering the panel, then less sunlight will be able to get through. A layer of dust, even less than 1mm thick, can block a substantial proportion of the solar radiation, preventing it from reaching the panel to produce power. To maintain optimum performance, solar panels should be cleaned regularly, manufacturers recommend a cleaning regime of every 6-8 weeks. Abbey Cleaning Services use a soft-bristled brush to clean the dirt from the solar panel, while at the same time jets of water rinse the surface. Because the water is then left to dry on its own, it has to be very pure, this means no harsh chemicals are used just ultra-purified water which ultimately will be more energy efficient for you! Your guttering stops rain water from damaging your property, so it is vital to keep it well maintained. If you allow your gutters to become clogged this may lead to water ingress. 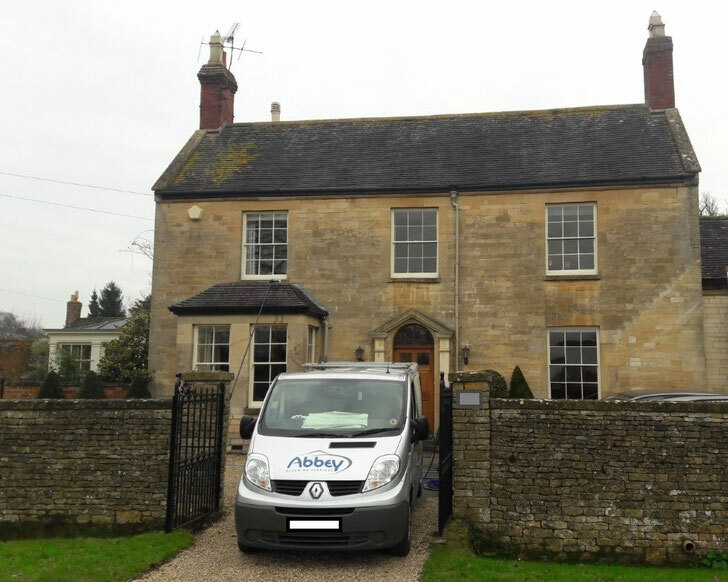 With our market leading pole system, Abbey Cleaning Services are able to offer over twenty years experience so you are guaranteed outstanding results so you no longer need to worry about your blocked gutters and dirty fascias.